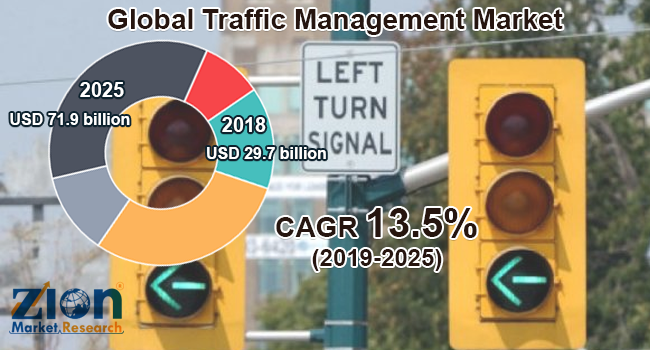 Global traffic management market expected to reach USD 71.9 billion by 2025, at a CAGR of 13.5% between 2019 and 2025. Rising tourism activities has led to an increase in the demand for car rental services. Car rental service providers, such as Uber, Ola, and Lyft, are focusing on expanding their business operations at a global level. The report analyzes and forecasts the traffic management market on a global and regional level. The study offers past data from 2016 to 2018 along with a forecast from 2019 to 2025 based on revenue (USD Billion). The assessment of traffic management market dynamics gives a brief insight into the drivers and restraints for the traffic management market along with the impact they have on the demand over the years to come. Additionally, the report also includes the study of opportunities available in the traffic management market on a global level. The report gives a transparent view of the traffic management market. We have included a detailed competitive scenario and portfolio of leading vendors of the traffic management market. To understand the competitive landscape in the traffic management market, an analysis of Porter’s Five Forces model for the traffic management market has also been included. The study encompasses a market attractiveness analysis, wherein all the segments are benchmarked based on their market size, growth rate, and general attractiveness. The study provides a crucial view of traffic management by segmenting the market based on component, system, and region. All the segments of the traffic management market have been analyzed based on present and future trends and the market is estimated from 2019 to 2025. Software, hardware, and services form the component segment of the global traffic management market. The system segment is divided into predictive traffic modeling system, urban traffic management, and control, adaptive traffic control system, incident detection and location system, journey time measurement system, and others. The regional segment comprises the current and forecast demand for the Middle East and Africa, North America, Asia Pacific, Latin America, and Europe with further division into the U.S., Canada, Mexico, UK, France, Germany, Italy, Spain, China, Japan, India, Australia, South Korea, Brazil, Argentina, UAE, Saudi Arabia, and South Africa. Some noticeable players of the global traffic management market include IBM Corporation, LG CNS, Siemens AG, Cisco Systems, Inc., Indra Sistemas, S.A., Swarco Holding, Kapsch TrafficCom AG, Accenture, and Cubic Corporation, among others.